According to video games, the only thing I'm interested in—when I'm not being lazy—is sunshine, fun and carefree living. In the world of video games, this is the stereotypical Caribbean person. Many video games I've played leave me with that all too familiar sentiment. Often, their portrayals extend beyond this idea of a sameness in identity. Instead, these representations move into territory that reinforce unflattering cultural stereotypes. Those stereotypes involve people who mostly speak in broken English, often implying a lack of education, and whose aspirations do not stray far from the formula of working by cheating customers, scheming, kicking around a soccer ball on the beach and lackadaisical attitudes. Last year, when my character in the 3DS game Animal Crossing: New Leaf frequented Tortimer's island for beetle farming, she was met by the stereotype of the haggling island native. Save for a few palm trees, banana trees and hibiscus plants, the island is home to a sole grass shack. In it, a family of Kappas conducted a booming island tourism business. The youngest member of the Kappa family, Leila, haggles hard for freshly caught fish and beetles. Leila uses cute phrases—possibly a product of her young age and, therefore, her propensity to mispronounce words—while begging you to "pweeeeeease" sell her the pricey, difficult-to-catch beetles found on the island's trees and palm trees on the beachfront. Her swindling tactics are at their finest when she is trying to negotiate outlandish prices. For example, a horned dynastid beetle, which normally sells at your town's Re-Tail store for 1350 bells (bells are Animal Crossing currency), goes for an asking price of a mere 67 bells in Leila's pretend supermarket. Her ridiculous asking prices are matched only by the hurt feelings she displays when you refuse. Leila lays on the guilt—perhaps another ploy of her expert bargaining skills—by resorting to crying, questioning your friendship and ultimately name-calling: "...But I fought we were fwiends...Yer...yer a big meanie!" Tidus, the stranger from Zanarkand and the protagonist in Final Fantasy X, washes up on the island shores of Besaid early on in that game. Shortly thereafter he gets hit by blitzball—a type of ball used in FFX's mini-game equivalent to soccer—that whizzes by his head during the Besaid Aurochs practice on the beach. Tidus soon meets Wakka, the friendly Besaid island native who has a thick accent and speaks in broken English. First impressions, as they say, are everything; and when Tidus displays his amazing Blitzball talents within minutes of their initial encounter, he immediately garners the attention of a smirking Wakka, head coach and captain of the twenty-three year old victory-less Aurochs team. 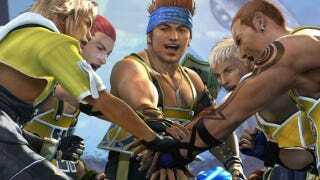 Believing Tidus to have suffered amnesia from toxins, Wakka capitalizes on a somewhat self-serving opportunity to recruit Tidus to the Aurochs—convincing Tidus that if he joins their team in the big Blitzball tournament, he would surely meet people he knew. Listening to Wakka during that initial cutscene of their meeting, he sometimes does not use full sentences when speaking to Tidus. When questioning what team Tidus played for, he questioned Tidus a second time: "What team you say again?" These broken lines are common in Wakka's dialog, but that's not all. One of Wakka's defining trademarks is that he ends his sentences in "ya?" His voice acting and characterization emphasize a stereotypical island trait, much like the one in which all Jamaicans say "yah mon." It'd be foolish of me to say that some of these representations are not grounded in some sort of truth. I know this based on my experiences growing up in Trinidad. We have many roadside meat and tropical fruit vendors, for instance, much like the sort found in games like Super Mario Sunshine's Delfino Island plaza. Some of our pastimes do include beach activities as well as soccer. We certainly have a lot of friendly people and a wonderful community that I am proud to have been a part of. And many video games prefer to take us on a virtual vacation to that perfect island destination: full of vibrant colors and NPCs who help to sell that charmed, laid back, easy-going atmosphere. On a very surface level, it can be endearing to be thought of as a friendly, happy-go-lucky person as per the creed of video game standards. But it's also aggravating to think that many of these stereotypes may be taken as the truth about island people's lives. There's more to the culture than beach life, and certainly more than that misconception of inherent laziness. Islanders aren't just interested in soccer. We're into cricket and other sports, card-based games, video game consoles and mobile games, too. Our lives can be more modern than what is portrayed in certain games. Our lives can still adhere to many cultural activities and traditions such as Carnival, multicultural religious holidays or even international musical events that feature steel pan competitions or musical bands on a global stage. We as a people suffer many of the same fears that others do about making ends meet to pay mortgages or funding our children's educations. And yes, some of us have less than ideal financial situations. Some of us have worked and continue to do so through honest means and perseverance. Trinidad also has its own identity as an island nation, just as we differentiate from other island's cultures in the Caribbean and tropical islands of the world. Not all of these examples would be appropriate for the setting of a video game, of course. But the emphasis in video games when representing island culture routinely focuses on already "known" subject matters or locations such as the beach, stereotypical as they are. It's too bad. Alternatives exist: crowded cities that look distinct from Chicago or New York, populations of diverse cultural beliefs, rich folklore, historically significant celebrations. All of this is largely untapped. But if handled correctly, these inclusions could lead to interesting locales, twisted video game monsters based on distinct folklore and perhaps even give a little humanity to people. Perhaps it would move things beyond the stereotypes found in characters with the same old smiles and expressions about how sunny it is. Some of these portrayals are not always meant to be taken so seriously, ya? Then again, I am a bit of an optimist. I like to give some people the benefit of the doubt that they know enough to not take these portrayals as reality. But then I remember the perplexed faces of those people whom I have had to inform that Trinidad is not actually a part of Jamaica, and that there are other islands in the Caribbean. I also remember those questions asking if grass skirts were itchy, to which I would have no clue how to answer. Unlike many of the Piantas—the residents of Isle Delfino in Super Mario Sunshine—we actually wore clothes made from cloth. Or I recall those instances when I was approached by quizzical minds marveling at my English skills even though English is the principal language of Trinidad. I have also been asked, in all seriousness, if I got around from island to island via canoe travel, even though Trinidad has an airport that has daily international routes. I still have a certain hope that my video games have the ability to get the small tropical island portrayals and its diverse cultures right. Sometimes, they do. It happened most recently when I played the latest Professor Layton game. In Professor Layton and the Azran Legacy, Layton & Co. found themselves hunting for puzzles and artifacts from an ancient civilization. Their quest took them on adventures all across the world. At one location, the group found themselves in a fictional coastal town on the Island of San Grio. I do not believe it states where this island is in the world, but San Grio boasts all the tropical island tropes to be instantly recognized as such. And, sure, the game does employ some stereotypical (and arguably whimsical) locations and the portrayals of them—the Wild West desert, the Amazonian Jungle—but Azran Legacy's tropical island representation was not completely misstated. To its credit, some of San Grio's residents speak patois—a mixing of French, Spanish and English—effectively representing some of the ramifications of the formerly colonial islands, my country of birth included. The use of patois does not feel like a typical representation of an island native communicating through a exotic language that is just recognizable enough for players to understand. It does not feel trite, nor does it give the impression of an uneducated island native. To me, it feels like a nod to a portion of my own culture born from a history of the slave trade and European settlement. The game was not perfect in that it still held on to some familiar stereotypes: the villagers who lived by the tradition of passing along "island happiness" to those who were in need of it, the boy who hustled his wares to Layton's group in trying to make a quick buck, and the seemingly jobless man on the beach with not much else to do than to exercise in the sun with a passing mention of a wife at home. Nevertheless, the use of patois was natural in its inclusion, and it was a cultural recognition I was surprised to find. It was one I realized I have been yearning to see in video games. These problems of cultural misrepresentation in video games are not unique to tropical islands and their people, as video games often apply these caricatures to other identities, as well. It's true that many stories do not require such a reliance on cultural or historical accuracy to make an interesting game. Nor does that knowledge need to be a focus when considering how fun a game is, or even to help tell stories. But, surely, in some cases at least, fitting a culture into the context of a game can make for an interesting novel or adventure. So why not have more of that for places less traveled, as Azran Legacy managed? Imagine fully-fleshed out narratives as told through more accurate depictions of well-developed characters and not through stereotypes and preconceived notions of varying cultures, people and identities. There are already some fantastic examples out of video games that bridge differences and connect players to others' views, hardships and worlds. Games with historical settings like Assassin's Creed: Black Flag and its Freedom Cry DLC explored narratives set during a time after the colonization of the Caribbean by European settlers, and the harsh truth of the slave trade that followed. The gut-wrenching Papo & Yo touched on the impact that alcoholism can have on anyone. It introduced us to the young, brave Quico, as we journeyed into his imagination that transformed a Brazilian favela into his escapist fantasy. Let's just think for a moment that there is more of the world out there that can be explored even further. There are cultures that have folklore, or real people with different viewpoints, experiences and stories to tell that could be intriguing and refreshing to see. There are stories that could fuel a game that would take you through some unexpected terrain, history, and personal struggles. You may be surprised at how diverse, curious, meaningful, rich, and maybe even relatable cultures can be, even those tiny specks of islands you might scroll past on Google Maps. N. Ho Sang was a longtime Kotaku lurker and is now a regular contributor to the Talk Amongst Yourselves blog. She has also contributed to Entropymag.org, and can be found on Twitter under the title @Zarnyx.